As this weekend’s BAFTAs celebrate the best in cinema and TV, we recognise those agents who go above and beyond in the world of top property. Roderick Easdale opens the golden envelopes, Illustrations by Mark Draisey. On the day of exchange of a particular sale, William’s clients were flying to the USA for six weeks and, at the last minute, the buyer pulled out. He reported the bad news to his clients just as they were boarding their flight and then got back on the phone to the buyer—30 minutes later, the deal was rescued. Acting quickly, he contacted a friend at British Airways and got a message radioed to the captain, who arranged for William’s clients to be served Champagne with the news that it was to celebrate the exchange of contracts. It is only appropriate that our best female agent award should go to one who epitomises the ‘show must go on’ tradition. Just before a viewing, Juliana was hit by a stone thrown up by a lawnmower and sent crashing to the ground. Worried that her eye was bleeding, but reassured that it was simply streaming tears, she conducted the appointment and it wasn’t until the viewers had gone that she went to A&E. The injury left her blinded for a week. Lindsey was meeting an owner just before a viewing, when the owner’s dog cocked its leg against her. With no time to do anything about it, she had to conduct affairs with a squelching left shoe and wet trouser leg. The following day, Henry the cocker spaniel sent Lindsey a letter of apology and a £20 note to cover her cleaning bill. Technically speaking, the supporting in this tale is by a cherry-picker, so it ought to receive the award, but the judges decided that Miles could collect it instead. At the house he was selling in Kensington, the buyer threatened to pull out unless the price was reduced as his surveyor had suggested it might need a new roof. However, the vendor knew that the roof was fine and that the surveyor had had no access to it, so ‘Air Miles’ hired a cherry-picker to show the buyer the (perfectly sound) roof up close. The buyer exchanged contracts that afternoon at the asking price. Katherine was going to a pitch meeting with a colleague. Said colleague, walking up the garden path, got attacked by a highly territorial goose, which nipped him in an exceedingly tender area. Katherine went to her colleague’s defence, so, when the potential vendor came to his front door, it was to find one agent lying on the floor screaming and clutching himself and the other chasing his goose, swatting at it with a company brochure. The good news is that the pair managed to secure the instruction. 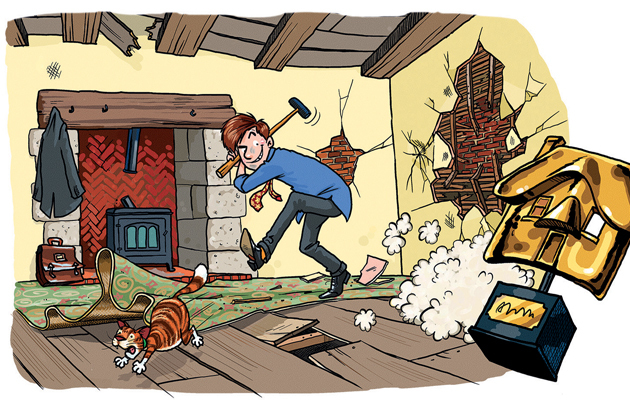 Andrew Scott has received more than one award, but we decided to allow it as he’s a smashing fellow—literally. Faced with a decent, if unexceptional, property that he couldn’t sell, he trashed it. It wasn’t that finding skimpily clad women in cupboards (see below) had convinced him he was living the hotel life of a 1970s rock star—it was a business decision. He marketed the property as ‘unmodernised’ with potential and sold it within the week—for more than its asking price. Mark agreed to collect a Spanish couple for a viewing. His Spanish was as poor as the English was of the couple he encountered, but, eventually, he got across to them who he was and what he was there for and he took them to the viewing. They liked the place, submitted an offer and ended up buying it. Only when the written offer was submitted, and he saw the buyers’ names, did Mark realise he’d picked up the wrong couple. Sisters Alison Buechner Hojbjerg and Kerstin Buechner run Quinta Properties, a Savills associate, in Quinta do Lago on the Algarve. The nomination for this award explains how the sisters ‘are known for their annual party, which has become the go-to event to kick off the social season’. However, one particular sale pushed Kerstin ahead. The buyer wanted all the furniture included, but the sellers refused to part with their designer bed. Neither party would budge, so Kerstin tracked down where the bed was from and ordered an identical one. Deal done. The citation from Ed’s employers explained that he ‘deals with ultra-high-net-worth buyers, which has resulted in some high-profile and private sales’, but it was the next bit that made our judges’ ears prick up. ‘His efforts to help secure a sale have included moving livestock for a helicopter to land, mowing the lawn, fishing out six frogs from a swimming pool and removing a dead badger from a client’s driveway.’ This made him a shoo-in—or shoo-away, anyway—for our visual effects award. 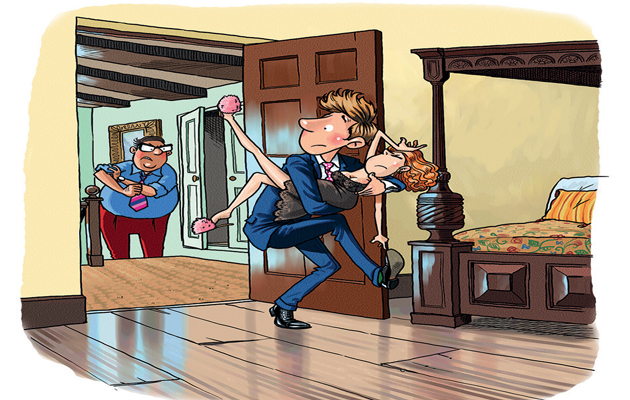 Andrew had a client who hated receiving prospective buyers for viewings, so she would hide in a wardrobe and Andrew would knock on the door to alert her when they’d gone. One day, getting no reply from his signal, he opened the door and found that the lady had passed out and, moreover, that she was only dressed in a skimpy nightie. As he picked her up to put her on the bed, her husband returned, just in time to see the back view of a man carrying his scantily clad wife into their bedroom. Simon instituted Strutt & Parker’s National Open House Day. He says: ‘I’d been to New Zealand and seen Open House Day boards across the street and wondered how could we use the idea. In the dark days of 2008/2009, we needed something to get people through the door, so, one wet January afternoon in 2009, we held our own Open Day and we received a fantastic response.’ Now held twice a year, the event entails all of Strutt & Parker’s properties that are for sale opening their doors to the public. Award winners were nominated by their fellow agents.